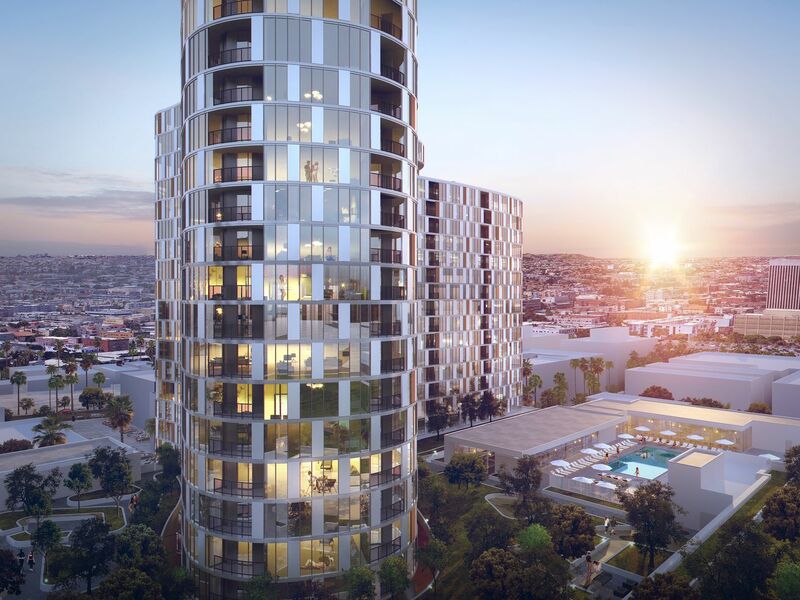 Construction is getting underway on a sock-shaped tower in Westlake that will overlook Lafayette Park, near the border with Koreatown. Developers Hankey Investments and Jamison Properties announced the project’s groundbreaking today. “As Koreatown’s housing market continues to flourish, [the project] provides a golden opportunity to revive an otherwise long-time vacant site, bringing much needed housing to the community,” said Hankey Investment Company president W. Scott Dobbins. Apartments in the project will range from studios to “three-bedroom, two story penthouses.” Rents will start at $2,000 a month and top out at $10,000 a month. Residents will have access to a large rooftop green space, gym, clubhouse, and dog park atop the building’s parking podium, which will hold 1,000 spaces for cars. Along the street level, the project will contain 15,000 square feet of retail space. The tower will sit at 2900 Wilshire Boulevard, east of the 3033 Wilshire apartment tower, which opened in 2016, and the historic Bullock’s Wilshire building, the home of Southwestern Law School. Designed by Large Architecture, the new apartment tower “was designed with a unique floor shape that avoids casting shade on the two parks that flank the project,” the developers said in a press release. See more renderings on the firm’s website. Jamison and Hankey just completed the Circa project, a dual-towered high-rise complex in South Park, across from the Staples Center and the stalled Oceanwide development.